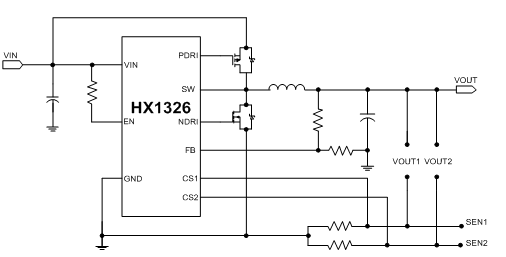 The HX1326 is a wide input range step down DC/DC converter from a high voltage input supply. Operating with an input voltage range of 8V ～ 30V, the HX1326 achieves 3.5A continuous output current with excellent load and line regulation. The synchronous architecture provides for highly efficient designs. Constant current and constant voltage mode operation provide fast transient response and eases loop stabilization. The HX1326 features a dual-channeling CV/CC mode control functions. It operates in the Constant output Current mode or Constant output Voltage mode. The over current protection current value is set by current sensing resisters. The HX1326 requires a minimum number of readily available standard external components. Other features include cable drop compensation, and thermal shutdown. The HX1326 converter is available in the industry standard SOP8-PP packages.